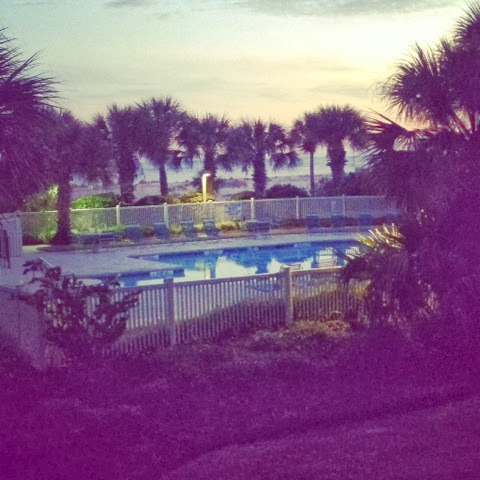 Throughout my formative years, the en vogue South Carolinian vacation destinations consisted entirely of Myrtle Beach, the garish, tourist Mecca suited for those of us firmly entrenched in the middle class, and Hilton Head, the higher class, golfer's paradise. Curiously, I never knew anyone vacationing in the Charleston area in those halcyon 90s years. Pity. Because while Myrtle has flash and HHI has panache, Charleston inherited all the southern charm missing from its popular big sisters. My college suite mates, Robin and Katie, once again met me in South Carolina for a wild weekend of decadence and giddy exuberance, but this time, we chose the Old Grande Dame, The Holy City, Charleston, and her bedroom communities of Mount Pleasant and Isle of Palms. 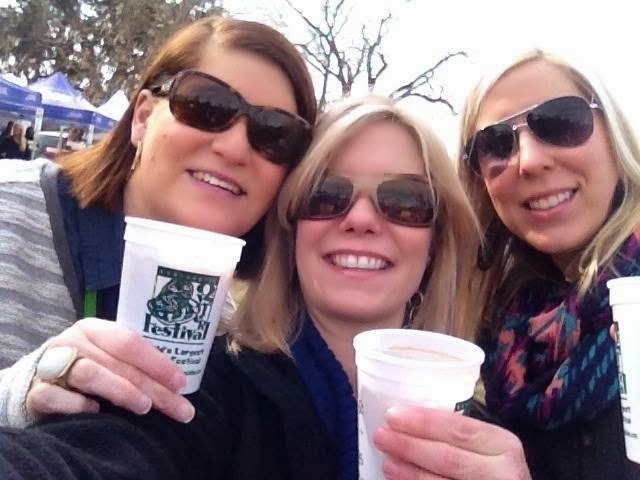 It was Katie's idea, I believe, to converge on the Lowcountry Oyster Festival for our girls weekend this year. And I thank her for that, because not only did we have a blast at the festival, but I believe both these gorgeous girls will be guest blogging in the next week or two with their recaps of that very delicious event. But I'm not here today to talk oysters. I want to tell you that while a country mile's worth of good eats resides within the boundaries of Chucktown, Mount Pleasant is holding its own. If you stay on IOP or in MP, hie thee to the Old Village Post House. 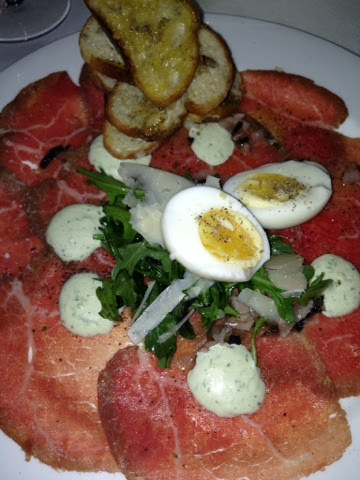 Get some beef carpaccio, first of all. Then feel free to send me something pretty in thanks. We ate twice at the Post House last weekend, and I had this dish twice. The first time, I adored the shallot-tinged black truffle vinaigrette and how it balanced the lush, soft, whisper-thin beef. 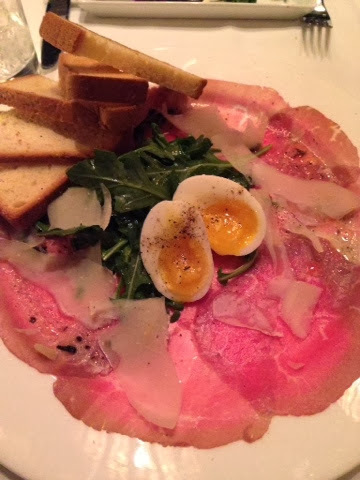 The peppery arugula salad, large, salty shavings of Parmesan, and rich, soft-cooked egg all worked in harmony to create a luxurious mouthfeel and über flavorful appetizer. The weakest link? The spongey, too-toasted Pullman bread slices served alongside, rather than baguette. But have no fear, because during our second visit, the dish changed ever so slightly! Note the garlic aioli in place of the vinaigrette, as well as the proper, airy, crunchy bread. I liked the dressing on the first dish better, and the bread on the second, but honestly, I'm mincing hairs here. This is a slam dunk. Also good at Post House: the Thai squash soup, which Robin correctly noted tastes like, "if velvet had a flavor." This also is a solid place to get your shrimp and grits fix on. While Katie and I agreed the shrimp were slightly overcooked, the tomato bacon sauce they were served in was bodacious enough, with a depth of flavor and skilled seasoning, to excuse the sin. Think amatrciana pasta sauce, but southerner up. 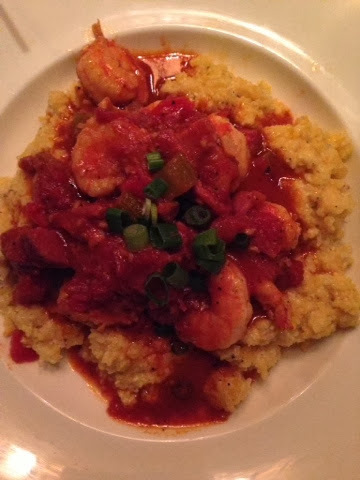 And the local geetchie grits were the exact point at which texture and flavor meet. That is also the point at which I groan whilst I eat. Because I am a huge fan of Chef Sean Brock and what he's doing with his Charleston eating empire - hyper local, Southern-only sourcing, heirloom products, etc - I dragged the girls to Husk for dinner. 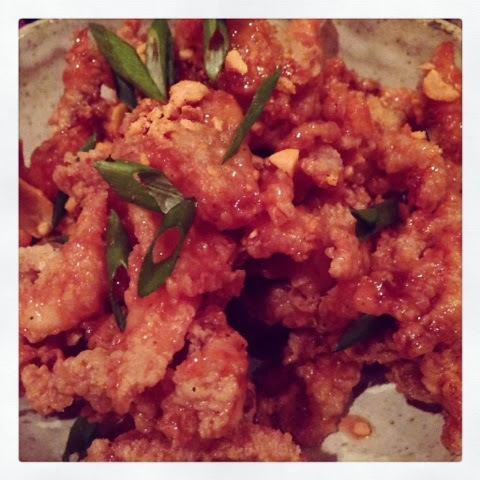 And I encouraged them to eat chicken skins, because I like to spread my gluttony around as much as possible. But it was the tomato salad with Bibb lettuce and pimento cheese vinaigrette that knocked our socks off at this sumptuous meal. The tomatoes were literally the most flavorful, tomatoey tomatoes I have ever tasted, the lettuce was almost silken in texture, the soft-cooked eggs (quite the rage now, I see) were battered and deep fried (thud), and the little chunks of savory incarnate country ham and dreamy, creamy, sweet and tangy dressing had us all yearning to lick the bowl. I haven't lost my mind over a salad like this since BC Restaurant's lobster affair with lemon cayenne vinaigrette. 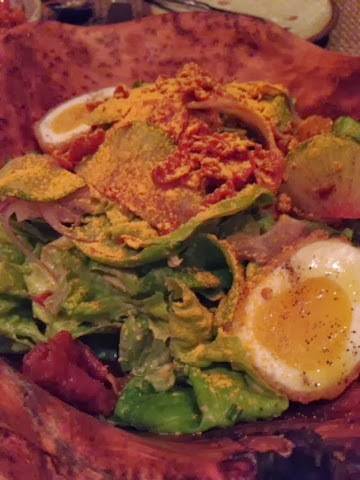 Husk changes its menu every night, but if any version on this salad is available when you go, order two. After all the pork, country vegetables, and luscious seafood you're bound to toss down your gullet at Husk, or FIG, or Slightly North of Broad, or The Ordinary, you might need a cocktail. Grab a cab, head towards upper King St., and find yourself a stool at Prohibition. 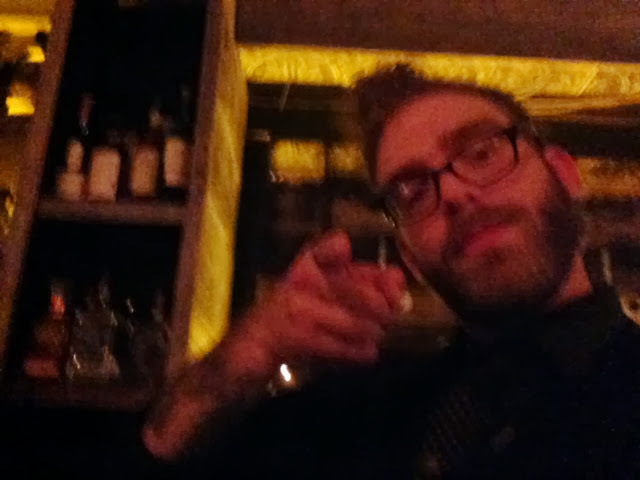 With luck, Griffin the Barkeep will be on the other side of the good ship S.S. Hipster, and his heavily inked arms will craft you one of the best drinks you've had in your whole life. Predictably, I partook of several margaritas made with jalapeño-infused tequila and housemade cilantro simple syrup. And at one point, Griffin sent a round of fireball whiskey shooters our way, which were tempered with some concoction that dulled the sting and made them sing. Once you've slept off the heady elixirs Prohibition is pouring, hair of the dog might be in order. The remedy is at Toast, on Meeting St., just up the road from the glorious hotel I stayed at during my last visit, The charleston Place. 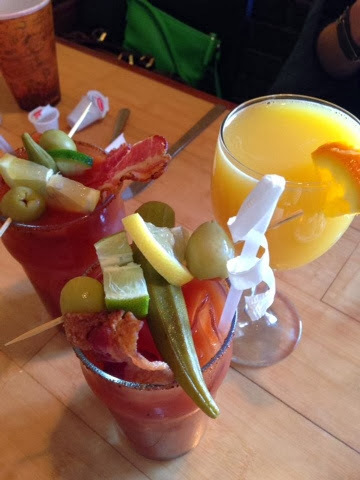 Toast is bustling, but it serves bottomless mimosas and bacon bloody Marys, which will really help you forget how long you waited for your table. The biscuits were not quite up to my muster here. They were lacking that pinch of salt and buttery mouthfeel each flake needs. 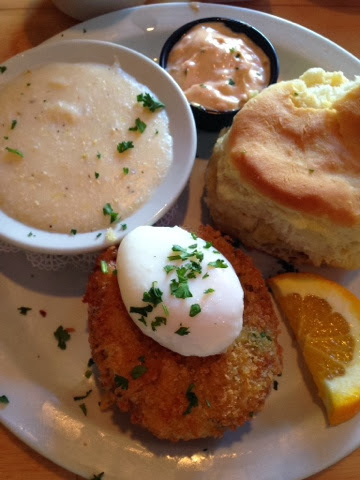 But the fried green tomato crab cake Benedict hit the spot, and overall, it was pretty good here. Put it on your list if everyone in your party isn't a total foodie, because the menu has a good selection. If you can't tell already, this is an area of our country with charm, attitude, and not a little bit of mystery. Check out these trees, for biscuits' sake! Sure beats the -6 degree suckitude I dealt with this morning on the way to work! Do we burn more calories in frigid temps? Please Lord, let it be. My hunger is big; my personality is bigger! We do burn more cals in frigid temps...so there's that? Oy. Everything looks stellar. I enjoyed seeing your eats on IG this weekend. Thanks, Steph! I'm trying to entice Log On and Eat, from Cooking Channel, to pay attention, hence all the IG activity. 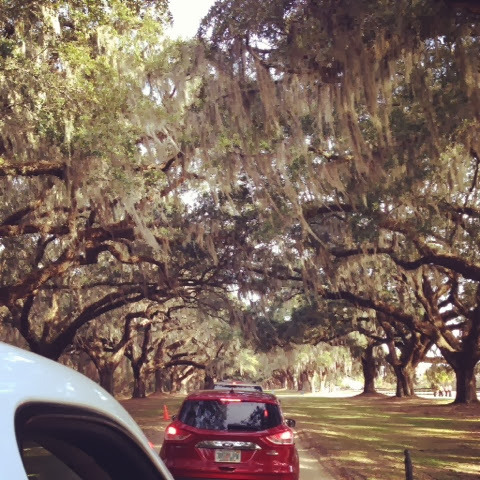 I do so love the Lowcountry! I'm jealous of your trip but thrilled you got to go. There is an incredible Northern dearth of country ham, pimento cheese, and good biscuits. I feel filled up on gentility and pork fat, and ready to face the rest of winter!